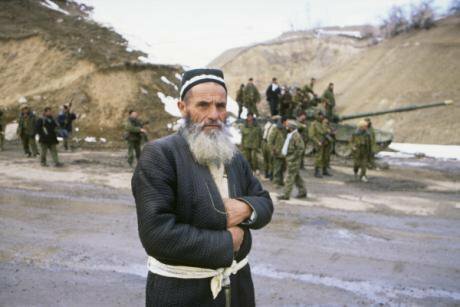 A Tajik villager during the 1992-1997 armed conflict between supporters of the central authorities and the various groups comprising the United Tajik Opposition (UTO). November 2006. Photo (c): R. Mangasaryan / RIA Novosti. All rights reserved. 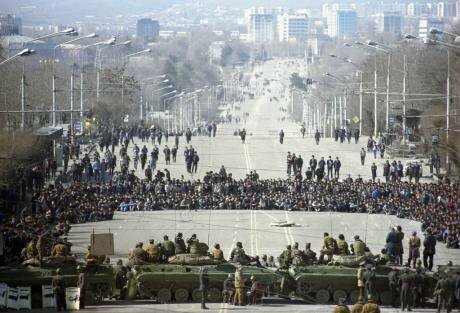 On 11 and 12 February 1990, the streets of Dushanbe teemed with thousands of protesters. These protesters in the capital of Soviet Tajikistan demanded improved living conditions and the fair distribution of housing from the authorities. The KGB’s Alfa division answered by opening fire, killing 25 people in cold blood. As a result, indignant citizens demanded the resignation of the country’s communist leadership, and the authorities dispatched 5,000 soldiers to crush the protests. To date there has still been no investigation into these events, neither by the Soviet nor the post-Soviet leadership of Tajikistan. For its part, the international community reacted to the protests as an internal matter for the (already doomed) Soviet Union. And in the end, the protests led to nothing but the start of a brutal civil war. The war in my country has remained forgotten against the backdrop of the other conflicts which accompanied the Soviet collapse. But we, the Tajiks, remember it perfectly — especially those of us like me, who live abroad. We see its consequences in the dictatorial regime of president Emomali Rahmon, who has ruled the country since 1994. Tajikistan’s civil war dragged on for over five years, leading to huge casualties. Over its course, between 35,000 and 157,000 people were killed, 37,500 households were destroyed. Some 600,000 people fled to neighbouring Afghanistan, and 195,000 were dispersed across other post-Soviet states. More than 1.5m people became refugees within their own country, in this mountainous corner of the former Soviet empire. September 1991 saw Tajikistan declare independence. Elections were held soon after, in which Rahmon Nabiyev, the former general secretary of Tajikistan’s communist party, emerged triumphant. It all went like clockwork: Moscow even congratulated Nabiev on his victory several hours before polling stations had closed. Nabiyev’s opponents complained, but the international community remained silent (which we became used to over the subsequent years). The country was now divided. The communists, or rather ex-communists who remained influential, supported Nabiyev, and they were opposed by a loose coalition of democrats and Islamists. By May 1992, Nabiyev had started to distribute weapons to his supporters. These were dark times. The political confrontation led to more bloodshed in Dushanbe on 5 May that year. Anatoly Belousov, deputy chairman of the national security committee, was recognised at Ozodi (now known as Dusti) square, after which some claim he threw a grenade into the crowd. According to Tajikistan’s former prosecutor general Solijon Juraev, on that very day, camouflaged security service operatives opened fire twice at a column of supporters of president Nabiyev in order to provoke further unrest (links in Russian - ed.) It worked, and by June 1992 fights had broken out across the country between pro-government forces and supporters of various opposition groups who would later become known as the United Tajik Opposition (UTO). Tajikistan: the first hybrid war? The echo of Tajikistan’s forgotten war can be heard far outside our country — even in Europe, where there are some uncanny parallels to be found. These conflicts are united by signs of “hybrid warfare”, not dissimilar to those which we witness today in eastern Ukraine. The conflict in Tajikistan also featured a single, external centre of command — the headquarters of the GRU’s former 15th army, based in Uzbekistan though practically subordinate to the general staff of Russia’s ministry of defence. The military might of the Russian troops intervening in Tajikistan on Nabiyev’s side were widely dispersed: featuring five motorised brigades and one special forces group from the 15th GRU army commanded by colonel Vladimir Kvachkov. The forces at Kvachkov’s disposal included over 100 soldiers and officers with military experience from Afghanistan, including those who took part in the capture of Afghanistan’s president Hafizullah Amin in 1979. Kvachkov, who went on the become a prominent ultranationalist, also commanded the 201st Motorised Rifle Division, with a strength of up to 10,000. Tajikistan was the first Central Asian state to call for a Russian military presence on its territory, and although Russian troops were ostensibly supposed to stay neutral during the opening stages of the conflict, the 201st division soon took sides and transferred weapons to the Popular Front (an alliance of former Communist strongmen struggling against the coalition government formed in May 1992, which included representatives of the democratic and Islamist opposition). In September 1992, Nabiyev was forced to resign and by the end of the year, both Popular Front and UTO politicians had resigned from their brittle power-sharing arrangement. 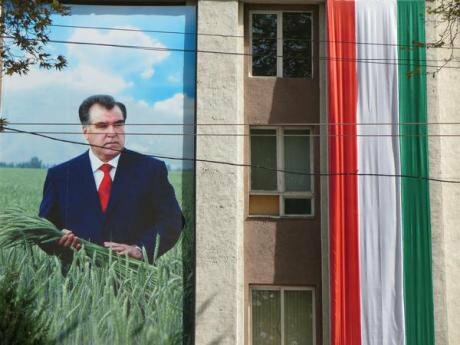 Tajikistan’s parliament promptly elected a government dominated by the communist old guard. At its head stood Emomali Rahmonov (now known as “Rahmon”), who remains Tajikistan’s president to this day. After mass unrest and growing discontent, martial law was declared in Tajikistan’s capital of Dushanbe. February 1992. Photo CC-by-SA-3.0: Vladimir Fedorenko / RIA Novosti archive. Some rights reserved. The 201st Division played a substantial role in securing the Tajik capital of Dushanbe for Rahmon’s regime. Russian border troops in Tajikistan and a motley CIS peacekeeping force including soldiers from Uzbekistan also played their part in bolstering government forces against the opposition. This intervention saw plenty of parallels with Ukraine, too — not least the attacking side’s strong advantage in field communications and media support, widely geographically dispersed military force (from Russia, Tajikistan and Uzbekistan). Rahmon’s forces also enjoyed the advantage of air cover by the Russian and Uzbek armed forces. These facts became known to the general public only after 2006, when Russian soldiers who had served in Tajikistan began to publish their memoirs of the war. Among them was Vladimir Kvachkov, who admitted his role in organising a “revolution” in Rahmon’s favour and the “establishment of pro-Russian statehood” in Tajikistan by storm. Nowadays, Kvachkov is most notorious for his attempted assassination attempt of Anatoly Chubais, Russia’s former deputy prime minister who played a major role in privatisation economic reforms in the 1990s. In his memoirs, Vladimir Kvachkov repeatedly stated that he had, “on Moscow’s orders”, organised five brigades of “militiamen” with Uzbek support, and dispatched them to southern Tajikistan. Kvachkov justified the decision to form brigades, and not divisions, on the grounds that his was a “network-centric” – that is, “hybrid” – war. He also discussed the role he played in the formation of Tajikistan’s Popular Front, and shared his tactics for recruiting fighters. While this information had come to light earlier, the witnesses were members of the Tajik opposition, so were labelled as “wahabbists” and “radical Islamists.” At the time, few appreciated just how tightly Russia controlled the information space. Eyewitnesses and researchers alike attest to a brutal military campaign in which ethnic cleansing and the murder of civilians based on their regional origin became the norm. The “Yurchiki”, named after Yuri Andropov due to the presence of many former KGB employees among the leadership of the Popular Front, fought brutally. The smear against their opponents as monolithically being “Wahabbist, extremist Islamists” was a peculiar one, given that the Tajik opposition received some support from Shi’ite Iran (to whom Wahabbi Saudi Arabia is a sworn enemy). The number of abuses was so extreme that, according to some researchers, even European human rights organisations played them down. One example was the massacre at the village of Sumbulak in Fayzabad region on 26 December 1993, where pro-government fighters murdered 71 civilians, including children. Despite it all, peace was eventually reached. Several factors were important — from simple war fatigue to pressure from Iran and Russia on both parties in the conflict. The rising threat of the Taliban in neighbouring Afghanistan also made stability and peace in Tajikistan a more pressing priority, aided by international mediators along with promises of development aid and reform. For over 15 years, hundreds of studies and books have been published and various conferences held about the “Tajik model of peace” as proposed by the UN and OSCE. That said, it’s forbidden for local media to mention that Rahmon became leader one year and two months after Tajikistan’s declaration of independence. Tajikistan’s declaration of independence in September 1991 was signed by Qadriddin Aslonov, the chairman of country’s Supreme Soviet between 1990 and 1991. Aslonov was murdered by Sangak Safarov, leader of the Popular Front, in November 1992. But for some reason president Rahmon did not hurry (or perhaps did not want) to investigate his predecessor’s murder. Journalists are also forbidden from mentioning that Sangak Safarov installed Emomali Rahmon as chairman of Kulob region, the Popular Front’s major stronghold. Indeed, Safarov was one of the most notorious figures in this story — a militia leader and crime boss who had spent 21 years behind bars, he managed Nabiev’s election campaign and was the de-facto leader of the Popular Front. Safarov was killed in suspicious circumstances in 1993. How the Popular Front came to be, and how Rahmon came to power, are both taboo topics for historians and political scientists in Tajikistan. Today, hundreds of books and documentary films recount this history as one of a “provoked war”, in which the “historical 16th session of the Supreme Soviet of Tajikistan” was the catalyst for Uzbek and Russian special forces bringing Rahmon to power. But state propaganda doesn’t mention who precisely “provoked” Tajikistan to armed conflict. Quite simply, anybody who dares to voice a dissenting opinion is accused of having fanned its flames. And you won’t find anything about it in the school textbooks. President Rahmon himself is attributed as the author of 22 books, including several on history. However, since at least 2000, Rahmon has avoid the term “Popular Front” and the name of his benefactor Sangak Safarov in all public speeches. The new building of Tajikistan’s national museum, Dushanbe, 2013. Photo CC-by-SA-3.0: Ibrahimjob / Wikimedia Commons. Some rights reserved. Visitors to Tajikistan’s new national museum, built with Chinese investments and featuring an floor space of 15,000 square metres, may find it strange that the exhibition on “modern and contemporary history of Tajikistan” makes no mention of the civil war. At Rahmon’s decree, these bloody years have no place in the national museum. The only acceptable way to speak about the war publicly is when attacking the opposition. This situation is unlikely to change for the better, as the state has a complete monopoly on the media. Rahmon’s favourite toy is television. It’s said that four state TV channels play simultaneously in his office. His name and titles are intoned in every news report. TV directors are even forbidden from depicting the president’s closest advisors, while Rahmon can phone the directors of TV channels at day or night with a demand to repeat or cancel a given broadcast. And these unpredictable instructions from on high occur so frequently that newspapers in Tajikistan have long since stopped publishing TV listings. Rahmon does not permit the establishment of independent TV channels. Founding one would be difficult, TV and printing equipment can only be imported with the written permission of the State Committee for National Security. Registration of printed publications requires the same. While the country prepares for the 20th anniversary of the peace accords, a ban is still in place against any mention of the Popular Front or the participation of any representative of the United Tajik Opposition. International efforts culminated in the signing of the accords of peace and national unity on 27 June 1997 in Moscow. The Popular Front, representing an alliance of northerners and some southerners with Russian and Uzbek support, came to a compromise with the Iranian-leaning UTO, which had come to represent the country’s central and eastern regions. This historic agreement provided for peace and security, elections and a multi-party system which ensured freedom of speech and an independent media. It suited everybody — even the UTO’s military wing, which had began to grow stronger and comprised some 5,000 soldiers and officers, agreed to fully lay down its arms and integrate into the government’s armed forces. In exchange for their complete disarmament and renunciation of any claims to seize complete control, the UTO was offered 30% of the positions in Tajikistan’s government and constitutional guarantees for the activities of religious parties. Free parliamentary and presidential elections were to be held, as well as a universal amnesty. As the Islamic Renaissance Party of Tajikistan (IRPT) had become the backbone of the UTO by 1997, this last guarantee was particularly important. Nevertheless, on 29 September 2015, Tajikistan’s supreme court declared the Islamic Renaissance Party a terrorist organisation and banned all its activities. Not only was the party a key player in the peace accords, but it had become the only legally functioning Islamic party across the entire post-Soviet space. As such, its outlawing amounted to a violation of the terms of the 1997 peace agreement, threatening Tajikistan with further political destabilisation. These are years to which we do not want to return. Leader of the Nation and president for life of Tajikistan, Emomali Rahmon. Photo CC-by-NC 2.0: Leiris202 / Flickr. Some rights reserved. The UN and OSCE acted as guarantors to the widely-celebrated peace accords in Tajikistan, with the support of Iran and Russia. Yet as recent experience has taught us, these European-sponsored written guarantees can be very brittle. We need only remember the Budapest Memorandum of December 1994, in which the United States, United Kingdom and Russia guaranteed Ukraine’s security and territorial integrity in return for Kyiv disbanding its nuclear arsenal. Neither agreement, for Ukraine nor Tajikistan, has provided an effective mechanism to protect societies against the whims of “populist dictators”. And for the moment, it seems that nobody, neither in Europe nor anywhere else, has a clue how to deal with them. Will representatives from the EU and OSCE take part in celebrations on the 20th anniversary of the peace accords? Certainly. Will they admit that international institutions have contributed to the establishment of yet another tyrannical dictatorship, burying Tajikistan’s hopes for freedom and democratic governance? Well, as the old Tajik proverb puts it: “Sari kafida - tagi toqi”. A bruised head should be kept under a skullcap.